On Buffy the Vampire Slayer Season 3 Episode 21, the Scoobies learn the truth about the Ascension, and Angel's life hangs in the balance after Faith's latest attack. On Buffy the Vampire Slayer Season 3 Episode 20, the Scoobies prepare for the prom, but someone plots to ruin the night with dangerous demons. On Buffy the Vampire Slayer Season 3 Episode 19, the Scoobies break into the mayor's office to steal a box, and Willow is taken hostage by a familiar foe. On Buffy the Vampire Slayer Season 3 Episode 18, Buffy gains the ability to read minds, and someone plots to murder the students of Sunnydale High. On Buffy the Vampire Slayer Season 3 Episode 17, Faith plots to turn a Scoobie to the dark side, and Buffy investigates how to stop the mayor from ascending. On Buffy the Vampire Slayer Season 3 Episode 16, Anya and Willow's spell misfires when it accidentally brings an evil being from another reality into the real world. On Buffy the Vampire Slayer Season 3 Episode 15, the death of Deputy Mayor Allan Finch eats away at Buffy, and a friend becomes a dangerous foe. On Buffy the Vampire Slayer Season 3 Episode 14, Faith and Buffy indulge in their Slayer activities, but things take a dark turn for the worse when a death occurs. 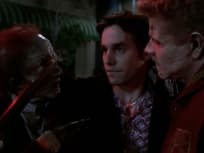 On Buffy the Vampire Slayer Season 3 Episode 13, the apocalypse descends onto Sunnydale, and Xander is pulled into an adventure against four undead criminals. On Buffy the Vampire Slayer Season 3 Episode 12, Buffy's Slayer abilities mysteriously disappear, and a deadly vampire holds Joyce hostage as bait against Buffy.